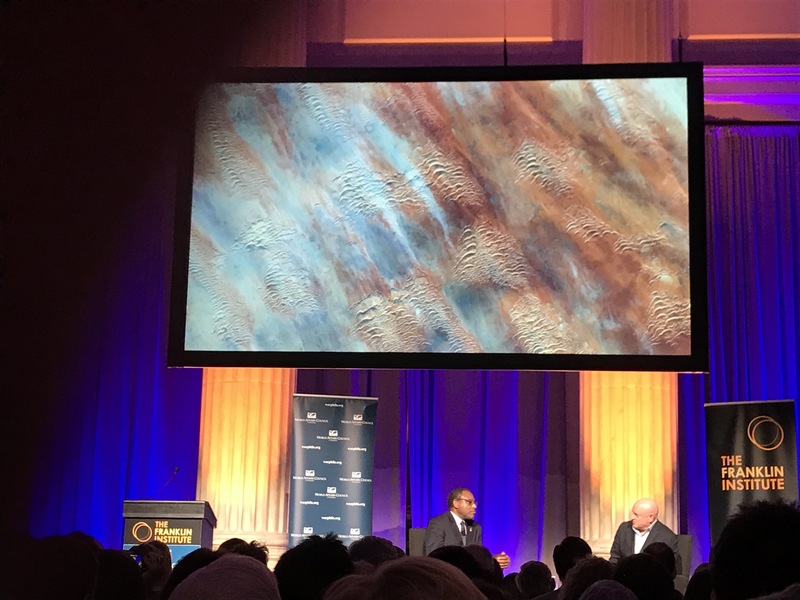 On the evening of November 7, 2018, I was fortunate to have the opportunity to attend The Franklin Institute Speaker Series. The speaker was retired astronaut and retired U.S. Navy captain Scott Kelly, presenting on “Endurance: A Year in Space, A Lifetime of Discovery.” I was familiar with only the basics of Scott Kelly – part of the crew of several NASA space shuttle flights, spent a year on the International Space Station (ISS), has a twin brother that is also a retired NASA astronaut, etc. I feel so fortunate that this lecture offered me the opportunity to learn more about the man behind the photos and tweets, more than his contributions to Earth and space science. 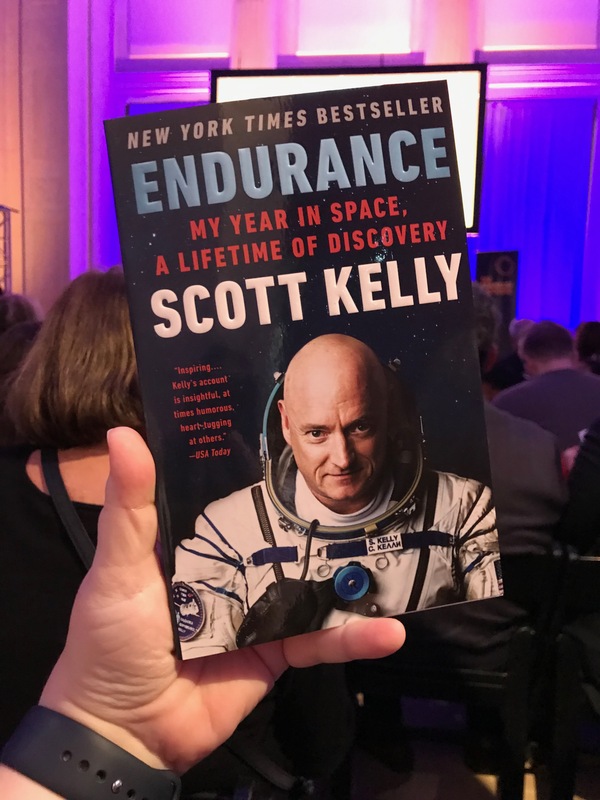 The evening started with Scott Kelly sitting in a chair opposite an interviewer, stating, “it’s great to be in Philadelphia – great to be in any place with gravity.” I was immediately struck by his sense of humor, which is so different than the very serious still images and perception I had about him (see the cover of his book, which we all received an autographed copy of). I was learning about his personality and Scott Kelly as a person, not just as an accomplished professional. He started with a review of his days as a student, and how he really didn’t know how to study. His lack of passion for school continued into college, and he knew he was not on a good path. Then, one day while strolling through his college bookstore his freshman year, he came across and purchased the book The Right Stuff by Tom Wolfe. After reading the book, he found his inspiration and decided to “fix himself” by learning how to learn. He said he took small steps to get on the right path. And almost 18 years to the day when he read the book, he had his first flight in space! Image from space shown during the evening, from Scott Kelly’s photo book featuring pictures he took from ISS. There were so many stories he shared. He shared that the top astronaut he respects in regards to the most skills and dedication is Gemini/Apollo/STS astronaut John Young. When Scott became an astronaut in 1996, he was assigned John Glenn’s parking space at NASA. One of his funniest stories to me was during his year in space, the San Francisco 49ers were in the Super Bowl. There was a screen where he was able to watch the game and decided to host a Super Bowl party in space – but no one showed up, as the cosmonauts he was with in ISS had never heard of the Super Bowl! Scott followed up by sharing that the biggest team sport is not football but space flight, with the need for attention to detail, the ability to be technical, and most importantly, the ability to play well with others. 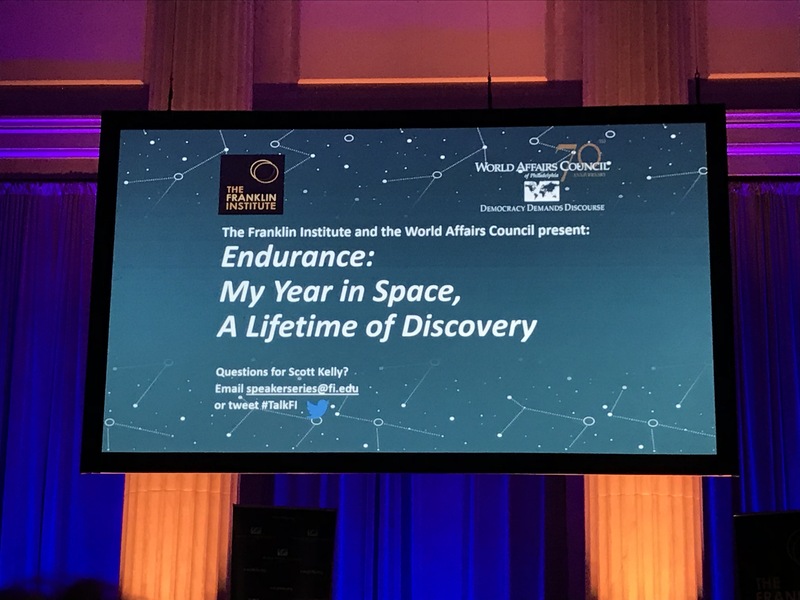 Scott Kelly thinks we have a future in space, as it is a destination to explore – he also said we need to explore our oceans more (yay!). 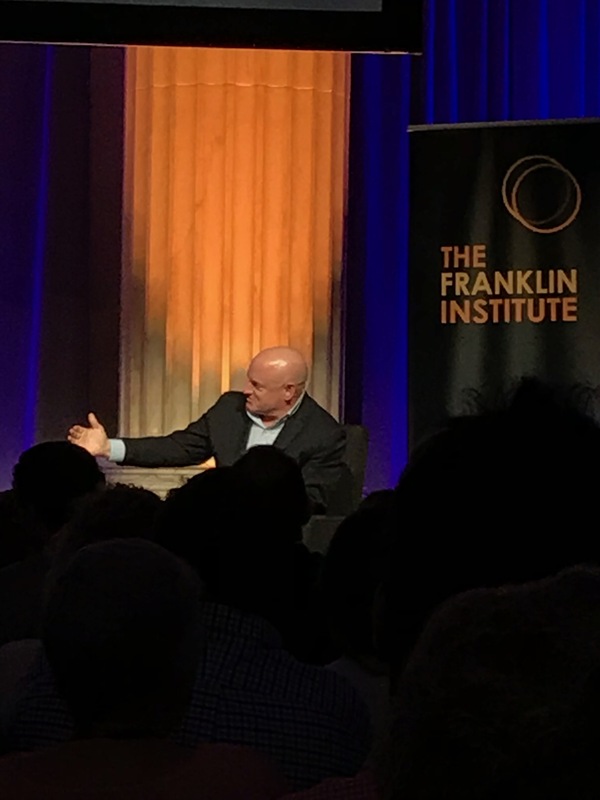 He brought up his twin brother, Mark Kelly, and joked how Mark only spent 50 days in space, while Scott spent 500 days. But he shared some insightful words by Mark, that Mark says going to Mars is not about rocket science, but it is about political science. We need to elect officials and convince the public – which is a challenge when we have high priorities to take care of at home. Scott said he would be willing to go to Mars, if there was a way he could return. Scott Kelly shared some important thoughts that I wish students were with me to hear. In addition to his rough start to college, he stated that STEM is important to national security and our economy. He said that students need to find their passion, their spark, and an inspiration that lets them discover what is important to them. Students should also study everything! Thank you, Scott Kelly, for taking the time to share your journey and your dreams for the present and future. I can’t wait to dive into his book and learn more about his life of discovery!